Monique Prieto, "Shrimp Chip," 2016, acrylic on wood panel, 10 x 17 1/2 x 2"
It wasn’t until last month that scientists finally “heard,” then graphed the presence of the those remarkably enduring “gravitational waves” which resulted from the collision of two massive black holes in space some 1.3 billion light years away. Art lovers can find metaphorical gratification at a far closer proximity in the synesthetic partnership of Roy Thurston and Monique Prieto’s two-person exhibition. A well-established veteran of L.A.’s light and space movement, Thurston offers new versions of his shimmering painting/sculpture hybrids which, when considered alongside Prieto’s five small diptychs suggestive of human ears, interweave the senses of vision and hearing. One can almost listen to Thurston’s works vibrating cosmically, while Prieto’s ears receptively “look” at and hear them. It must be pointed out, though, that these shows quite intentionally are meant to stand alone. Fans of Thurston will swoon over the surfaces achieved with silicon and pigment painted over machine milled and subtly contoured aluminum. One work is painted in meditative magenta and another in a politely punk pink, though both of the iridescent surfaces in these works catch, shift, reflect and refract light via their concentric rows of patterned grooves. What’s more, you won’t need a Cal Tech-made device to feel these colors vibrate between the hues of sunrise and sunset as you shift your gaze or position. A dozen twelve-by-six foot panels hang side by side to form a muscular structure that holds, perhaps paradoxically, rows of nine hundred pink painted, almost delicately affixed silicon rivets. One thinks simultaneously of the recently deceased Ellsworth Kelly’s monochromatic tone poems, Barnet Newman’s existentially stark vertical columns, and the pointillist/impressionist obsession with dabs of light diffusing color. No matter how one hears or sees it, Thurston’s work in this show delivers both emotionally and aesthetically in the kind of equally powerful minimalistic measure that remains his works' signature. 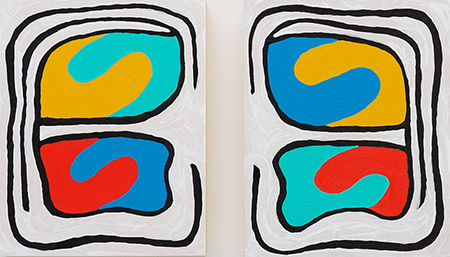 In her “Good Listening” acrylic on linen diptychs (note the no-doubt vibrational nod to the Beach Boys) Prieto presents pairs or sets of playfully painted shapes suggestive of human ears. The space between the panels of each diptych alludes both to the ears’ literal distance between one another and to the more challenging distinction between merely hearing and truly listening. Configured in stacked and playful organic shapes of various colors (a synesthetic suggestion once again) these labyrinth-like “halves” seem to absorb everything “in sight” while also “conversing” by listening to each other. The partial spiral patterns of the ear shapes also suggest cross-sectioned lemniscates, that geometric form which when traced back to its ancient Greek roots stands as a symbol for infinity and for energy’s eternal flow. Like those newly perceived (by astronomers) but really primordial gravitational waves, Prieto’s ears and Thurston’s rhythmic emanations of light happily mingle together to their mutual benefit.